Hackberry Tree, Celtis occidentalis, is a U.S. native tree that is also referred to as common hackberry, sugarberry, nettletree, beaverwood, northern hackberry and American hackberry. 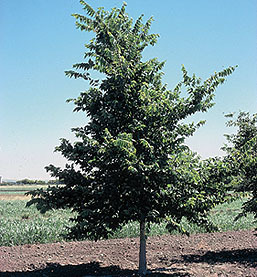 Hackberry like most trees grows best in organically rich, well drained soil in full sun to part shade. However, this tree will grow in the worst soil conditions and still provide great shade, feed the wildlife and act as a specimen or street tree. You will find your hackberry producing greenish flowers which are mostly insignificant in April to May. By fall, the blooms have pollinated and are not berry-like drupes that mature to deep purple. These fruits are a favorite for many birds and other wildlife. Midwest cities like Hackberry Trees as street trees because of their tolerance to wide ranges of soil and moisture conditions plus it is drought tolerant. Is a favorite tree for planting in hunting food plots. Easy size for transplanting into your landscape and garden settings.